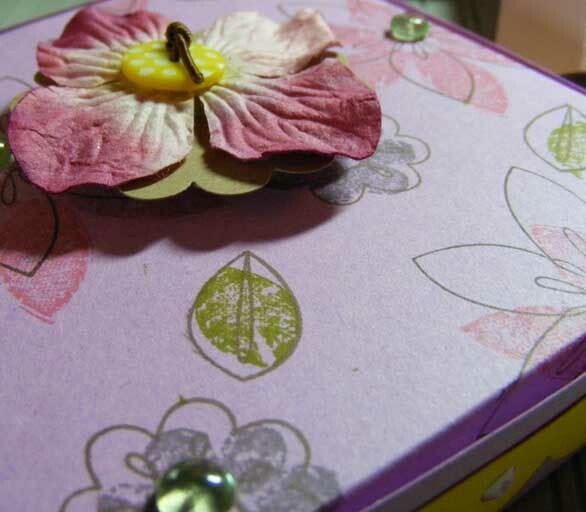 and, I’m so sorry, I am doing crafty stuff, but a lot of it is samples, which I then have to rush off and forget to take pictures. Anyhoo, this is just a quick (after about 4 attempts huhum!) 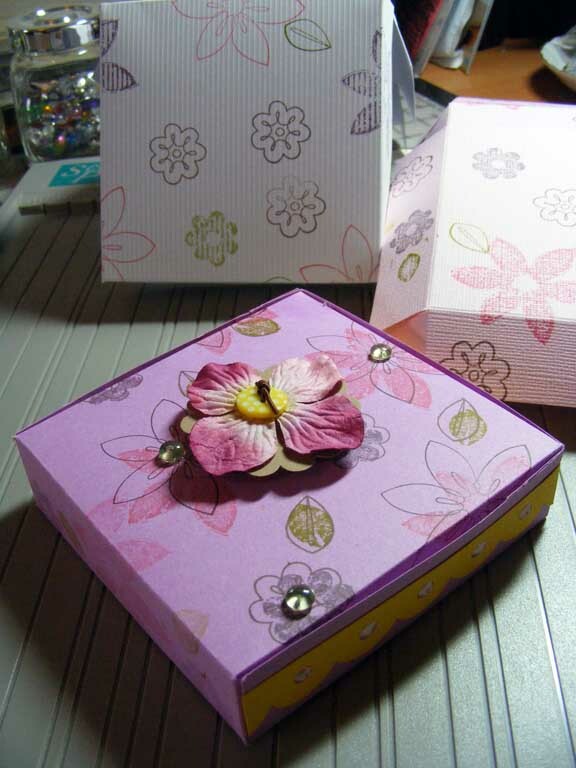 box, that the fabulous Queen of Boxes – Kit – came up with on her blog a week or so ago. I don’t mind admitting, I am frighteningly thick sometimes, and she comes to the rescue with boxes on a daily basis via email (thank you Kit it’s always much appreciated). I used some of the Papermania Christmas Acetate that I managed to bag at the weekend – uhohhh, big mistake ….don’t get me wrong, it’s lush …… but, like iron, and takes an enormous effort to either score or punch holes through the stuff (defo need the Crop-a-dile) to do the job. I shall probably use this to house some socks for Mother-in-Law. 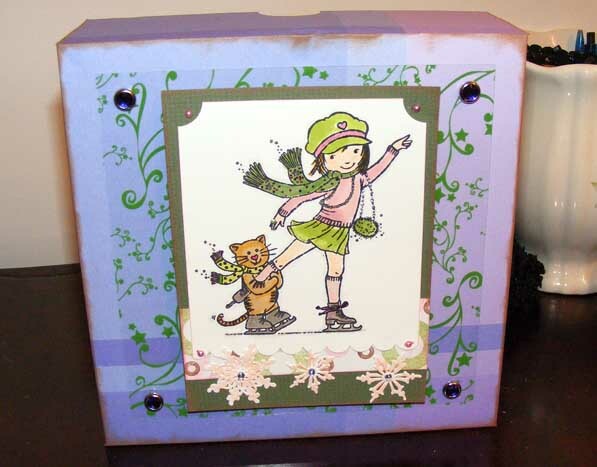 Of course, I used the fabulous Toodles & Binks Skate Stamp (KXR-005), which was designed for us by Kathleen Rietz. Coloured with COPICS and Sakura in some points. Actually, big drama here this evening, my E0 (Skin White) COPIC has run out – shocking only been using it every day for 18 months!!!!!! A large box from Artifolk addressed to Guy, now correct me if I’m wrong, but the only reason he’d shop at Artifolks would be to buy COPICS, and the only person that uses them is moi ….. see where I’m going with this one …………….. especially darlings as I furnished him with a large list of my wants a few days ago. 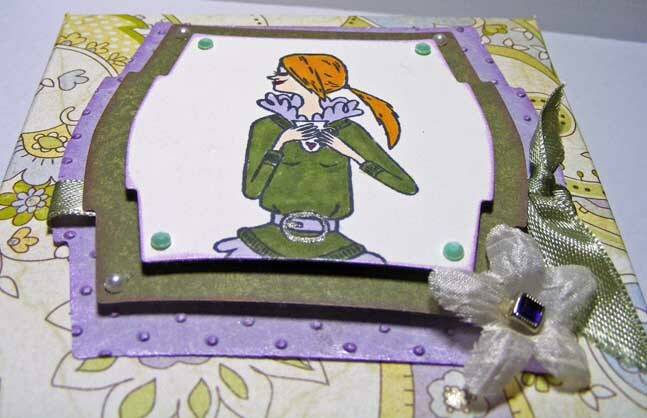 I poked and prodded the box, and I am also happy to report it’s a big ‘un – YAY for me! Still, I shall still have to pop over to Artifolks as I simply cannot be without Skin White, and I can’t categorically promise that other colours from the list might not drop in my basket!! it’s simply no good, I can’t concentrate on craft at the moment – for anyone who’s read this blog for any amount of time, you will be aware that apart from my Darling Husband and David Tennant the other man I completely adore ……the complete comic genius ……………..Mr Jon Richardson………. is finally coming South. I don’t know what tempted him into Kent, and quite frankly I don’t care – he’s coming and that’s all that is important (ahhhhh sad, sad woman, but I am happy in my little world of craft and comedy!). Guy and I had a conversation about what I wanted to do for my birthday yesterday, and I’d plumped for a meal as I didn’t think there was much comedy around that I would be interested in, so imagine my excitement when I got my Ents24 email this evening (also imagine Guy’s relief that I didn’t read said email in Sainsbury’s as the resulting squeeeeeeeness would have been far too embarrassing for the old chap). There’s one slight moral dilemma in all of this wonderfulness though, and that is Toodles – now she adores the funny and gorgeous one just as much as I do, and a veritable revolution has just taken place when she was told by her Father that he didn’t think it would be suitable, and therefore no ticket for her. Oh those eyes, and tears …………. I am a bad parent obviously, because I’ve just had a good go at getting him to book that extra ticket. I think that between us we can weedle and cajoule him to giving way (I’ve long ago given up trying to stop her listening to the podcasts and secretly watching the Paramount Comedy recordings of him anyway). and am current quite proud of myself, as I managed to embed a bit of my own video into it. Hopefully, I’ll get better at doing it as I go! I am working on a detailed project sheet for this, and will post it on the Toodles & Binks blog later on today, but thought I’d share in the meanwhile. I’m addicted to mini pizza………. well the mini pizza boxes to be fair – I’m not secretly stuffing mini pizza (even though I’m a grade A chubby bird ‘cos I am not definitely not rowing at the moment)! After seeing all the fabulous things created by Kit, of the Toodles & Binks DT members’, I got the urge to get myself a Scor-pal. I’ve also ordred the cutting mat that sits right on top of it, but they didn’t actually have any in stock, oh and got some of the Scor Tape (that fabulously strong). Sigh, I know I’m addicted to tools, and already have a Score-it, but I have to say that the Scor-pal is truly an impressive bit of kit. I can’t think why I didn’t get one before, I really can’t. Not the most marvellous stamping/embellishing I’ve done to date, but Lydia’s friend Henry came over yesterday evening, with his Mum in toe, as she wanted me to show her how to stamp, and these were some of the dry runs, so I had a project to do with her.